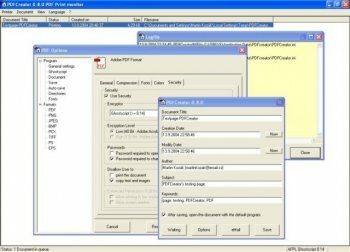 PDFCreator easily creates PDFs from any Windows program. Use it like a printer in Word, StarCalc or any other Windows application. Full of spywares, bundled with an unsolicited 30mb soft that I don't need and the worst of all is that the pdfs that creates have watermark, a piece of junk. Sorry! I meant version 2.1.1, not 2.2.1 in my previous review. PDFCreator is now at version 2.2.1. It has abandoned its old ways and does not add unwanted stuff anymore. At least in the "expert installation" mode. In the past even expert installation needed a lot of attention to avoid this "extra" stuff, for it was inconspicuous. Now the only optional addition is the "Images to PDF" program, which is clearly shown. I even chose to install it. Now I can give it five stars. Hijacked Chrome, Firefox, and IE. Changed homepage to MSN. Would reset homepage to google and as soon as browser was reopened it switched homepage to MSN again. It took hours to track down because I installed other software and lots of updates in the last few days, but uninstalled PDF Creator and it went away. Re-installed and it came back. Uninstalled and it went away again. Never got the toolbar that others have noted might be installed. Just switching the homepage. The best among PDF printers that I have tested. It never distorted a page, even in cases where other PDF printers (including some non-free ones) failed to do a good job. Beware however, to use custom installation and to choose what to install as it comes with optional stuff that many people do not need, including offers from advertisers that are irrelevant for its task. The PDF Architect program that comes with it, and which is also freeware and developed by the same developer, may or may not be useful for you. Up to the recent version, there was no option to customize its installation, but this has been fixed in version 1.7, and you may now choose not to install it, or as I chose - to install it but with no plugins that integrate it with other programs. First, it does what it says it will do. I prints to PDF. Second, it does what it doesn't say it will do, and that is that it bundles additional software. Yes, you can decline the install of part of the crapware that it comes loaded with, but then it forces the install of Adware in the form of PDF Architect, which will also attempt to integrate it into the browser. While some, like the reviewer before me, will say "hey that's great and this is a terrific program", others like myself and the technologically inclined that he's raving against, would rather not have some program take liberties with a system when all we were looking for in the first place is a simple printer driver that will print to pdf file. For this reason, middle of the road marks with a recommendation that you seek something else like Bullzip PDF printer. Developers... get a clue. Let people know your stuff is out there, but don't force feed it. I'm amazed at the latest comments. People here are supposed to be geeks in some way. I can't believe that you're crying about a checkmark or a "decline" button. Seriously, are you THAT short-minded? The program itself is very good and now they even offer a light version of an Acrobat-like app for free. Yes there's adware THAT CAN BE AVOIDED. I understand that my clients CANNOT read through the several NEXT > NEXT > NEXT install dialogs but YOU? A really good program that turned really bad. Uninstalled and telling people to avoid it from now on. This is still crapware! Should be rated as "0" but its not available. Either the developer does not read comments about his product or (and most likely) does not care what we think. Complaints of "crapware" have been around for several years. Why does FileForum continue to list such software? Again OpenCandy included on installation. There are better alternatives out there. Used to be a great programm... However, the bundled SweetIM broke my Google Chrome profile so all of my other extensions and settings were lost. Beware. pjafrombbay you do feel convulsive for letting this product down, even if you gave a new suggestion every time. If you know how to install the product you will not get any crap on your pc. One star because there is no "Zero" star option. PS: a rating of * is too high for crapware but is the smallest available.